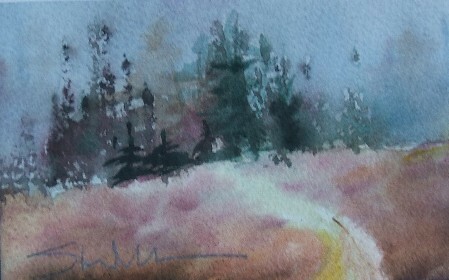 This is a post card size painting ( 4 inches by 6 inches),it could easily fit into a standard size mat and 5″ by 7″ frame. I have a propensity to like paintings of paths and doorways, I’m not trying to go new age on you, but there seems to be a message that speaks to me. This entry was posted in A painting a day, painting, Postcards, watercolor by shanti marie. Bookmark the permalink. It looks like a magical place. Beautiful inviting colors.